In regions except quoted the cost of transport incurs you. You will always be informed about the cost before sending your order. Ag. Dimitrios, Ag. Paraskeyh, Ag. Ioannis Renth, Ag. Anargiri, Ag. Varvara, Egaleo, Alimos, Ampelokipi, Argiroupoli, Votanikos, Voula, Vrillisia, Galatsi, Gkazi, Gkyzi, Glyfada, Dafni, Elliniko, Exarchia, Ilioupoli, Irakleio, Kallithea, Kareas, Kato Patisia, Kiffisia, Kolonos, Koukaki, Kipseli, Lyccabetus, Marousi, Moschato, Neo Psychiko, Nea Ionia, Nea Smirni, Nea Filadelfia, Nea Chalkidona, Paleo Faliro, Paleo Psychiko, Papagou, Pirea, Penteli, Peristeri, Petralona, Peyki, Platia Attikis, Sepolia, Tayro, Tzitzifies, Imitto, Filothei, Chalandri, Cholargo. For the best delivery of your order, we will need all the details of the receipent (including name, surname, address details, postal code and a phone number). In case that we fail to find the recipient, we will contact you, so do not forget to provide us with your full details. Our system is able to accept multiple orders for more than one recipients by following the standard ordering procedure only once. With our customer service, you have the option to trace the progress of your delivery, through an e-mail that is automatically forwarded to you by our system. You will have to bear in mind that all kinds of flowers are not available always, or during all the seasons. If your request is for a specific species or colour of flower, it would be better if you provided us with an alternative (by e-mail), so that your order is received on time. If. for any other reason, a replacement order is necessary, we assure you that we will create something similar for you that will match the quality and the value of your order. 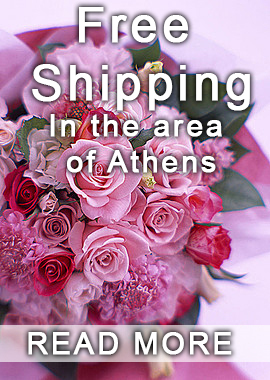 All our products seen in our website are made of professional florists, with fresh flowers imported daily from Holland and delivered immediately in Athens. Depending on the area delivered, products can occasionally be slightly different than the original pictures, depending on the flower availability in each area. Any replacement needed, will not influence the aesthetic result of the bouquet. In certain occasions, some of the offered bouquet bases might not be available. There might be a replacement with a similar one that will match the value, the quality and the aesthetic appearance of the flower creation you picked up. In any case of replacement you will be accordingly informed. For orders in special places like hospitals, harbours, airports or cemeteries, where the delivery is not always done to the recipient, the signature of the person that receives the flowers is considered as a certificate of successful delivery. Some orders received 24 hours before major ceremonies (Christmas, Easter, St. Valentine’s Day, Mother’s Day, name days etc) are considered as orders with an open date of delivery, which means that there might be a 24hour delay in delivering the service. In case the recipient’s address is beyond the area of our flower shop, some carriage expenses might occur. In such case, you will be immediately notified either by phone or by e-mail. For your own interest, you can call us at 0030 – 210 – 7225900 and be accordingly informed before proceeding with your order. You can cancel your order at any time, before the flower creation is sent. You can not cancel your order in case the order is on its way or it has already been delivered. In order to cancel your request you need to e-mail us at info@flowerdesign.grand mention your full name as well as the code of the order. Flowerdesign.gr is not responsible if, due to Acts of God (e.g. bad weather conditions, strikes etc) some orders are not delivered on time. In case there is some problem, we will contact you immediately to resolve it and make sure your request is fully satisfied.